Several personalities, including the Presidents of Mali, Ibrahima Boubacar Keita, and Rwanda, Paul Kagame, Moussa Faki Mahamat, president of the African Union Commission, Chadian Prime Minister Albert Pahimi Padaké, and Florence Parli, French Minister of the Armed Forces are taking part in the meeting, alongside Senegalese President Macky Sall. According to Moussa Faki Mahamat, the Dakar Forum has become “a major meeting point for strategic thinking in Africa” and offers an opportunity for fruitful exchanges on the opportunities offered by research, development and field experiences. “Against the new threats, a new vision is gradually emerging between the United Nations and the AU. These new threats require our states’ security cooperation and exchange of information,” he said. The French Minister of the Armed Forces, Florence Parli, said the forum has become an anticipated event for rich exchanges with interesting conclusions. It seeks solutions to the security issue in Africa. “This forum, by its openness, allows Africa to speak to itself and find its own solutions to its problems. France’s commitment to this forum is intact, and France will not abandon its African partners,” Parli declared. According to its organizers, this edition has nearly 700 participants from regional and international actors, political and military authorities, experts and academics, diplomats, representatives of international organizations, civil society and the private sector. The two-day meeting will focus on the need for integrated approaches, promoting exchanges, sharing experiences, synergies at the national, sub-regional, regional or regional level. 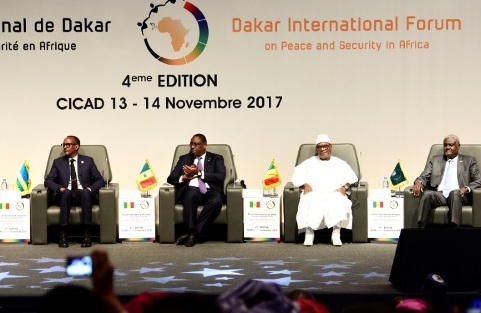 The Dakar Forum was born at the Elysée Summit on Peace and Security in Africa held in 2013 in Paris, where African heads of state had planned to deepen reflection on the framework of the Dakar Forum. The holding of a high-level panel, shortly after the opening ceremony, will be the major innovation of the 2017 edition of the Forum.